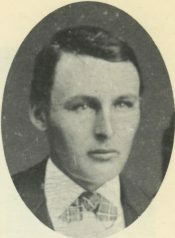 Samuel Johnston, businessman, contractor and horseman, was credited with saving harness racing in Fort Erie, Ontario when its future in Bertie Township was threatened by a fellow citizen who deemed horse racing violated an act relating to public morals. Johnston mustered support by residents, farmers, hotel keepers, millers, harness makers, drillers, blacksmiths, millwrights, barbers, merchants and wagon makers – 270 in all – who endorsed his petition to council on November 5, 1898, in opposition to the Stockdale proposals. He noted rather forcefully that the prohibition of racing in Fort Erie would have serious economic consequences for investors in the Fort Erie Racing Association and the tax base of the township. Both the council and Stockdale recognized the merits of Johnston’s argument and acknowledged the public support for the continuation of racing. It is duly noted in council records that Stockdale withdrew his notice regarding the proposed by-law. Johnston is credited with having the political insight and perseverance which culminated in ensuring the growth and development of horse racing in his area. Interestingly, after Johnston died in 1919 at the age of 64, his 100-acre homestead on Nigh Road in Ridgeway later became the homestead of another prominent harness racing family – that of William Gilmour Sr. and his sons William (Buddy), George and Lloyd. Buddy Gilmour was inducted into the Canadian Horse Racing Hall of Fame in 1988 in acknowledgement as one of the finest horsemen in North America. And perhaps unwittingly, Johnston who was a pioneer in his community also became a pioneer in the Grand Circuit of harness racing.